Sri Lanka's government has given its strongest indication to date that it will go beyond enumerating missing persons from its 26-year civil war and investigate the circumstances of their disappearance. Activists, however, remain skeptical, pointing to the administration's history of empty gestures. In August 2013 President Mahinda Rajapaksa appointed a three-member Special Presidential Commission to inquire into the war-time missing; in July 2014 he supplemented the Commission with a five-member panel of international experts to guide the process; and in August 2014 he granted the Commission and the panel a six-month extension of its mandate until February 2015. The Commission, which has to date received more than 20,000 complaints of disappearances, is expected to submit a report in 2015 that will include the number of missing persons and recommendations for action, but the government has been historically tight-lipped as to its plan for acting on this information. When asked by IRIN during a meeting with journalists at his residence on 19 August whether the government will institute a tracing mechanism to fully investigate missing persons once the Commission's report is complete, Rajapaksa responded: "We have to look into this, but it is tedious work." The president's secretary, Laith Weerathunga, said the government's next course of action on missing persons will be determined by the Commission's report, and argued that the government was making genuine moves to address the plight of the families of the missing. "Such instances of missing need to be looked into and investigated," he said. The International Committee of the Red Cross (ICRC) was granted in August unprecedented permission to assess the needs of the missing and ICRC officials told IRIN they too were optimistic that a tracing mechanism would be in place after their survey is completed in early 2015. However, activists warn, such moves come on the heels of repeated broken promises by the government, and fresh rejection of a UN investigation into war-time human rights abuses. "After years of delaying tactics and false promises, it is clear the government is both unwilling and unable to end impunity and independently and effectively investigate its own alleged abuses," Richard Bennett, Amnesty International's Asia-Pacific director, told IRIN, pointing to the government's refusal to cooperate with an Office of the UN High Commissioner for Human Rights (OHCHR) investigation launched in March 2014. The issue of missing persons, especially those who went missing during the final year of fighting, has been contentious. The UN Office of the High Commissioner for Human Rights has recorded 5,671 reported cases of wartime-related disappearance, not counting people who went missing in Sri Lanka in the final stages of fighting from 2008 to 2009. The International Committee of the Red Cross (ICRC) says it has received reports of 16,000 cases of missing persons dating back to the 1990s. Sri Lanka's government-appointed in 2010 a Lessons Learnt and Reconciliation Commission (LLRC), which a year later recommended the creation of a centralized database on missing persons. An advisory panel set up by UN Secretary-General Ban Ki-moon, however, argued that the LLRC response to allegations of missing persons had been insufficient. In its 2011 report , the panel noted that "a survey of public transcripts of testimony given by individuals having suffered personal harm reveals that . over 80 percent of victims [who testified at LLRC hearings] raised issues of disappeared or missing relatives." Regardless of the numbers, activists say the process of investigating individual cases has lagged. "It has been five years since the conflict ended and the tens of thousands of victims, at the hands of both government forces and the Tamil Tigers, are no closer to justice," argued Bennett. However, Rajapaksa and other officials reiterated that the government will neither cooperate with, nor recognize, the OHCHR mission. "We don't recognize their mandate," said Foreign Minister Gamini Lakshman Peiris, referring to the UN investigation. "We have a duty to strengthen the local Commission," he argued. Relatives of missing persons from Sri Lanka's 26-year long civil war hold their pictures during a meeting in Sri Lanka capital Colombo. Rajapaksa accused the international probe and High Commissioner Navi Pillay of being biased against the Sri Lankan government. "I don't think anybody will take them seriously other than those who want to," he said. Amnesty's Bennett called the government's reluctance "entirely predictable", explaining that the move "follows a very familiar pattern of the Sri Lankan authorities refusing any international attempts to bring genuine justice to the tens of thousands of victims of the armed conflict." Beyond allowing the ICRC to begin its survey, the government has offered no details on its next course of action will work. 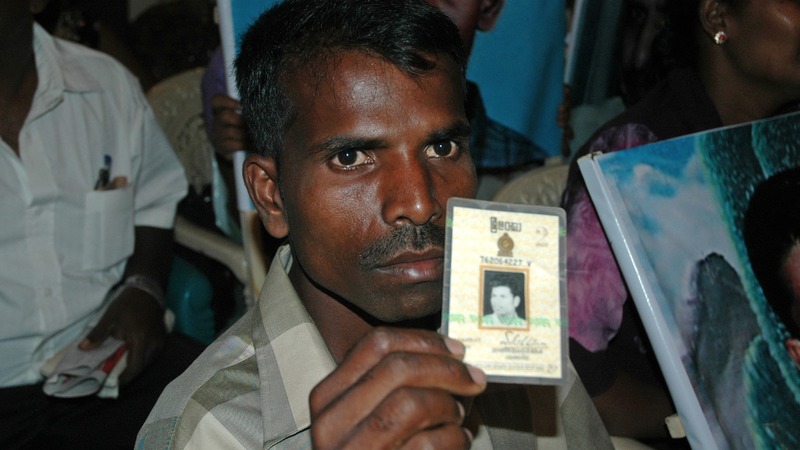 Some suggest Sri Lanka ought to replicate the tracing mechanism in Nepal where NGOs and the Nepali Red Cross Society have been searching for details of the over 1,400 missing persons during the 10-year civil war that ended in 2006. Meanwhile, the Geneva-based International Service for Human Rights on 25 August accused the government of failing to protect local activists from "a clear pattern of systematic reprisals against human rights defenders and victims in Sri Lanka who seek to engage with the UN." Bennett argued tracing missing people should come in tandem with effective justice mechanisms. "An effective mechanism for tracing the many thousands of missing people is urgently necessary, so is truth and justice for victims of enforced disappearances and other abuse," he said.